Good Day! This year’s 3rd Annual 2017 DC Women’s Equality Day Advocacy Action and Celebration was a huge success! 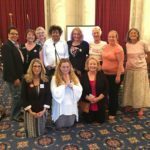 While the group that attended the Advocacy Action was small, it gave a powerful voice to the reinvigorated efforts to pass the Equal Rights Amendment. To watch local news coverage of the Advocacy Action Click Here….